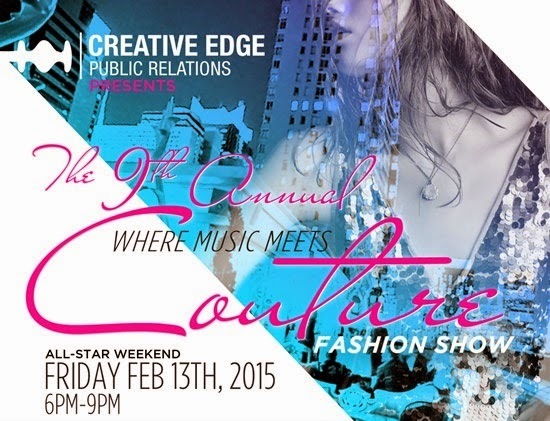 Calling all lovebirds, fashionistas, music aficionados, and philanthropists- On Friday, February 13, 2015, Creative Edge PR will host its 9th annual, ‘Where Music Meets Couture,’ Fashion Show at The Attic Rooftop Lounge in NY, NY. The event, perfectly timed to woo smitten couples in lieu of Valentine’s Day, is also set to kick off the NBA AllStar weekend, as well as will take place amidst the height of the illustrious New York Fashion week. The grand affair will feature a couture fashion show, complete with international designers from across the seas, urban music favorites, past and present day athletes, and will also draw celebrities from both coasts. Upon conclusion of the star studded showcase, a post celebration will commence, hosted by none other than Boxing Champion great himself, Floyd Mayweather. In true CEPR fashion, the swank soiree, though in honor of the firm’s clients and past year’s successes, is held in support of two worthy charities. A portion of the evening’s proceeds will benefit the Chris Culliver Foundation and Walter Thurmond Foundation for Arts and Education.